Stan Strickland (left) leads the way as the Express Yourself cast members demonstrate one of their song-and-dance numbers. Eight-year-old Eleanor Allione already knows what she wants to be when she grows up. “I want to work on a farm, be a singer, and take care of animals,” said the bashful, bespectacled little girl from Salem, swiveling in place with one shoelace untied. The farm and the animals can wait: She is already a performing star. Eleanor is one of dozens of children who sang, danced, and drummed on the stage at the Citi Performing Arts Center-Wang Theatre in Boston last month for the 20th anniversary gala of Express Yourself, an arts immersion program in Beverly for at-risk youths and children who receive Department of Mental Health support. At the theater, children as young as Eleanor through high school age joined their adult mentors in a series of gleeful routines, with some help from members of Stomp, Blue Man Group, and other troupes. They stalked the stage dressed as zombies during Michael Jackson’s “Thriller,” bopped in pink wigs to the helium-toned “Barbie Girl,” and joined Wampanoag tribesman Annawon Weeden in a storytelling display. Express Yourself debuted with a modest show in the Wang Theatre lobby 20 years ago; the show has taken place on the venue’s main stage for the past several years. A nearly full house of family and friends at the gala performance cheered on the performers, many of whom were featured in a video testimonial to the positive effect of the organization. “That’s what this program is all about — being on the big stage,” Josiah “Joe” Spaulding, the Wang Theatre’s president and chief executive, told the audience. 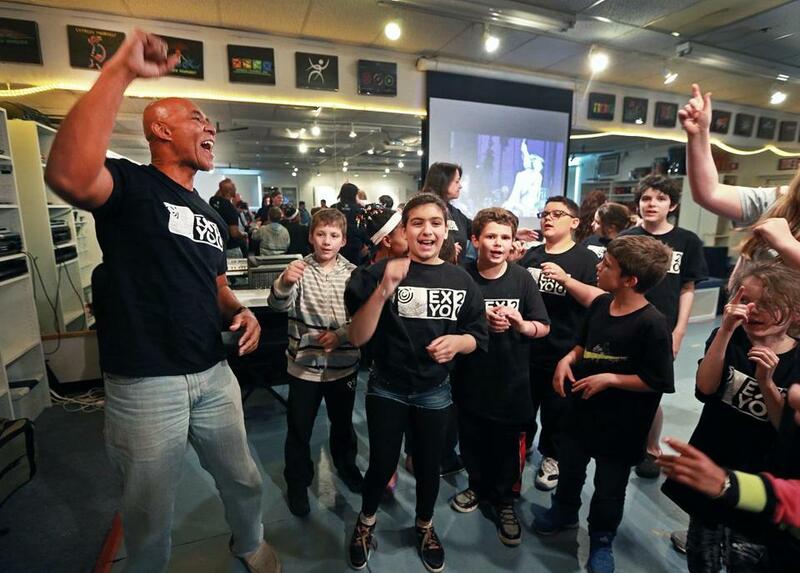 One week after the anniversary show, the staff, mentors, and students of Express Yourself gathered in the Beverly workshop on Rantoul Street for their annual wrap party. The room smelled like pizza and cupcakes, the back door was open to the warm spring air, and the clanging of the nearby commuter rail line filtered in periodically. The show at the Wang Theatre — one night only, nearly a year in the making — is “like one of those flowers that blooms for one day,” said mentor Nic Bennett. “A very exotic flower,” added a colleague, to group laughter. Conrad, a choreographer with a master’s degree in creative arts in learning, taught with jazz musician Stan Strickland at what was then called Lesley College; they are now the organization’s executive directors. Conrad had studied in Strickland’s voice and movement therapy class, and they later ran workshops at various schools. “We began traveling to different areas with the bongos in the back seat,” said Conrad. Their work quickly took shape as the Express Yourself program, which has become a model of success. In 2009 Conrad and Powers, who is studying for her master’s degree in public health, represented the program at the White House, where Michelle Obama presented them with the Coming Up Taller award from the President’s Committee of the Arts and the Humanities. Express Yourself is designed to help children who might be alienated due to behavioral or mental health issues to develop the coping skills they will need to join “the 21st-century workforce,” said Conrad. “It was like going from a high school baseball field right to Fenway Park,” said Bennett. Between the Beverly space and special “off-campus” events, the program serves approximately 500 students each year, said Conrad. About 125 attend the after-school program twice a week, constructing sets in the basement and working on routines in the ground-level studio. There is a small storefront gallery for student artwork next to the main entrance on Rantoul Street. The location has been great, said Conrad. Express Yourself has a close working relationship with nearby Endicott College, and the proximity to the train has been a logistical bonus. Several mentors agreed that they have stayed on because of their positive experience in the program. “Express Yourself saved my life,” said Cushing. At the workshop, the students were sitting in rows, watching video footage from the Wang performance. They took a break and formed a scrum with Strickland, clapping and dancing along to “Happy,” the hit song that was a centerpiece of the big show. At the back of the room, Danvers High School student Patrick Walsh, a new junior mentor, watched the kids dance. Though 10-year-old Tatiana Meggie-Maddrey of Lynn said she and her little brother do not usually get along, she and 7-year-old Isiah sat side by side in the front row, watching the video. Her older brothers were impressed by her performance in the show.